Ballycastle harbour is situated on the North Antrim coastline, famous for the picturesque Glens of Antrim, Rathlin Island and “the aul lamas fair”. However, for sea anglers and specimen hunters alike, Ballycastle sound offers a far greater attraction. I have enjoyed many successful trips from this harbour with local skipper Sean McKay, targeting large Pollack and Ling over deepwater offshore reefs, and specimen Conger at anchor or during slack tide. 40lb Conger taken on a Ballycastle wreck aboard "Lady Linda"
If the tides are too large, or the weather unsuitable, there are inshore marks over sand banks and broken ground for a variety of Rays, Haddock, Cod, Whiting, Ling, Plaice, Dabs, Gurnard and specimen Spur dog. The Ray and Spur dog are particularly good sport at anchor, with a bag of rubby dubby tied to the anchor chain to provide a scent trail. For the Conger enthusiast, a small wreck lies in shallow water close to the harbour and provides excellent angling for specimen Conger, large Bull-Huss, specimen Ballan Wrasse and Dogfish. This is a handy back- up venue if the weather is too severe to venture out. Rathlin Island deserves a mention. It is an L- shaped island, seven miles long situated six miles north of Ballycastle. A ferry service runs daily from the harbour to Church Bay in Rathlin and takes about forty-five minutes. Steeped in history, and with great interest for bird watchers, divers, botanists and geologists, it also offers superb potential for shore angling. There are numerous bays, reefs and deepwater rock marks to explore from both boat and shore, holding Pollack, Coalfish, Conger, Ballan and Cuckoo Wrasse to specimen size, and plentiful shoals of Mackerel through-out the summer months. If all this isn’t enough to whet your appetite, Ballycastle has another secret to reveal. 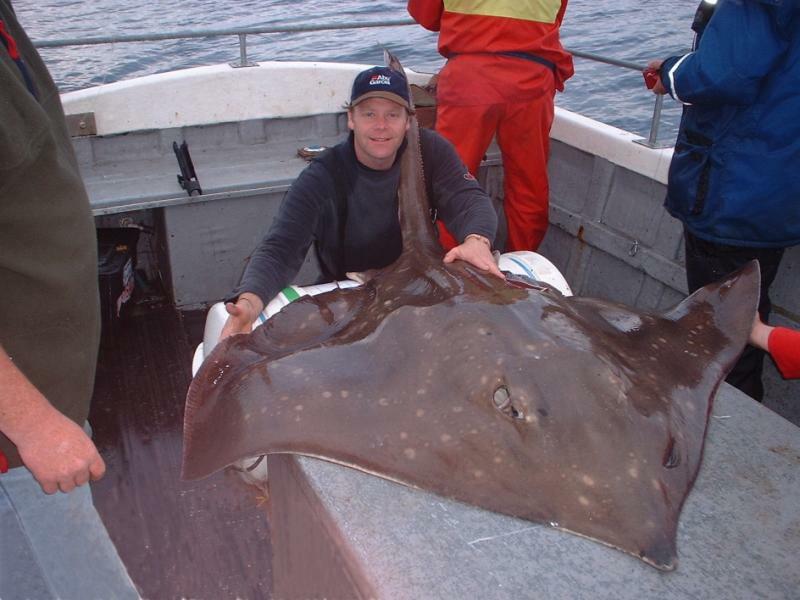 Several years ago, Sean heard that a local commercial long liner had taken two large skate close to the harbour. Deciding this was worth looking into, he organised a trip consisting of three local experienced anglers and myself. The day soon arrived, and as this was the middle of winter with fresh bait in short supply, a box of frozen Mackerel had to suffice. On the short journey to the mark, two dozen Mackerel were finely chopped, placed in an onion bag and attached to the anchor chain, to provide a scent trail along the seabed. As the anchor took hold and the boat swung round with the tide, we dropped our whole Mackerel baits slowly down, through two hundred and forty feet of water to the bottom. Although there was the usual buzz of excitement and anticipation amongst us, we were all taken by surprise when local man, Shane Mc Nicholls’ rod received a solid thump after only twenty minutes. A second nod and he lifted into an obviously large fish, and as the rest of us reeled in to avoid tangles, Shane fitted the harness and settled in for a battle. Considering this was his first ever Skate, Shane played the fish very professionally, and after a forty-minute fight, we all stood amazed as this “barn door” appeared below the boat. It was a female and measurements placed it in the region of one hundred and sixty pounds plus. A fine specimen and an image that none of us will ever forget. It took several more trips, watching other angler’s land these monsters, before I finally achieved my dream. A small party of anglers had booked Sean for an evening Skate trip and they were a man short, so Sean kindly invited me to join them, I didn’t need to be asked twice. An hour after anchoring, the first fish of the evening was boated, a female of one hundred and thirty pounds taken on a two pound Pollack. It shows the size of bait these fish can handle. I watched in envy as she was measured, photographed and tagged, before being gently eased over the gunnels and away un-harmed. Not for the first time I prayed for a bite, and then it came, the tell-tale heavy nod followed by a powerful twenty yard run. I lifted into the fish and immediately became aware of the tremendous weight and pressure Skate are able to exert on tackle and body, and wondered whether all my trace knots and crimps would hold. A forty-five minute struggle led to a huge fish, a female of one hundred and ninety six pounds. This was an awesome sight, and an ambition realised. She was tagged, photographed and released, and as I baited up, with hands still shaking from adrenaline, I wondered if I could handle another one. I hardly had time to think about it, as the rod nodded again and I lifted into another fish, this time it felt more powerful by far. “Looks like a male this time” the skipper shouted, and he was right. A smaller skate of one hundred and fifteen pounds but they scrap a lot harder as I found out. It took over an hour to land this one, and as I played it, the angler beside me hooked another of almost identical size. Four fish landed in four hours, not bad going by any standards. At the time of writing, Sean has been responsible for tagging hundreds of skate, an enviable record over recent seasons, along with Tope, Spur dog just under Irish record, and specimen Spotted and Cuckoo Ray. The story continues, as a small Halibut was recently taken over a rarely fished sandbank, and Porbeagle Shark have been sighted close to shore, none of which are normally fished for, and only last year a fisheries officer reported Tuna sightings off the back of Rathlin. Something for the future perhaps? Most of the angling mentioned is accessible to the small boat owner, with a superb slip and mooring facilities. It must be noted that as with all venues, local advice is recommended. There are severe tidal races between the mainland and Rathlin, and on around Fair Head. Try to pick settled weather on a neap tide to avoid problems. Shore angling can be excellent around Ballycastle, with miles of relatively un –explored rocky headlands. Pollack taken over the "Pinnacles". Typically, Pollack, Coalfish, Wrasse, Bull-Huss, Conger and Dogfish are the main species. Lead-heading, spinning and free lined ragworm can be very productive for the Pollack, and fly fishing for them is heart stopping, if you can work out how to stop them heading back into the kelp. The beach to the east of the harbour produces Bass, Flounder, Dogfish and Coalfish, with Turbot and Plaice possible through summer months. Sea Trout can be found at the mouth of the river. The breakwater and pier are excellent for Pollack and Coalfish, and have been known to produce fine Cod over winter periods, with Conger in close and shoals of Grey Mullet around the moored boats in the sheltered marina. With the vast amount of angling available, overnight mooring facilities and easy accommodation, Ballycastle is rightly becoming one of Northern Ireland’s top sea angling hotspots. Basic mixed species tackle in the twenty – thirty pound class, with 50lb class suitable for Skate.